PERHAPS USEFUL FOR 'FREE' USERS, WITHOUT THE OBJ-EXPORTER OPTION AVAILABLE. of image-files [..._Textures] if appropriate. By default the files use the SKP's name with spaces etc squeezed out. By default the files and sub-folder are put into the SKP's folder. A starting dialog allows you to give an alternative filename/folder. You are asked if you want to make all Texture files PNG format? export the 'Selection Only' [Yes] or 'Everything Active/Visible' [No]. By default the Units are in 'meters'. By default All Exported Faces are Triangulated . By default the Y & Z axes are swapped. or rotated textures are UVmapped appropriately using the main texture-file. Where possible shared-vertex data is reused ensuring correctly formed geometry. 1.1 20110106 Image class method extensions only load if not already defined. distorted 'unique texture' files [like the Pro-OBJexporter]. 1.3 20110225 Glitch with some distorted textures 'flipping' addressed. Instances now properly defined and UV-mapped. 1.4 20110228 The new Filename now has spaces etc squeezed out. occasionally missing from complex faces now addressed. 1.5 20110323 Glitch with 'smoothed normals' addressed. 1.6 20110402 Option to export all Texture files in PNG format added. 1.7 20120118 Material images with no filetype now auto-revert to PNG. Tolerance for deciding if 'distorted texture' relaxed. 1.8 20120214 Fixed issues with flipped-instance reversed face vertices. 1.9 20120215 Completely recoded. Issues with flipped-instance fully fixed. 2.0 20120217 Tolerance checks for deciding if 'distorted texture' improved. 2.2 20120220 Raw geometry hidden/off-layer merging during export resolved. 2.4 20120221 Recoded - speed ~v1.8, fixed flipped-instance face-reversal. 2.7 20121008 Alpha now set as d= and Tr= for cross-platform compatibility. or the whole model if the context is model.entities. any shared-vertex entries are now 'reused'. Or get/install the SketchUcation Plugin Store dialogand thereafter you'll be able to AutoInstall all of your Plugins within SketchUp itself, without having to even download an RBZ at all. Works fine for export to Blender 2.55 ! This exports materials as well? So I don't have to use FBX? Cool! I'll try and post you a donation, but I have to wait until after Xmas, because I'm still awaiting payment from a couple of people). Pilou wrote: Works fine for export to Blender 2.55 ! hey pilou, could you get the materials into 2.55? The .obj file has content, but cannot be read by Vue or Cheetah3D. Have you saved the SKP before exporting? Have you tried exporting a very simple box with some textured materials applied to it. I will render my SU-Model in DAZ-Studio (http://www.daz3d.com) so I need my model as OBJ and I'm very happy to find these plugin. But after the import (.obj and .mtl) in DAZ (or I tested it also in MeshLab) not all textures are correctly. The wrong textures a not the biggest problem, I can fix it in DAZ, but a lot of skins are declared as "Default material" but there are not default. So I can't adjust them separately. Is where anything I can do to fix it? User2012 wrote: I will render my SU-Model in DAZ-Studio (http://www.daz3d.com) so I need my model as OBJ and I'm very happy to find these plugin. But after the import (.obj and .mtl) in DAZ (or I tested it also in MeshLab) not all textures are correctly. The wrong textures a not the biggest problem, I can fix it in DAZ, but a lot of skins are declared as "Default material" but there are not default. So I can't adjust them separately. Is where anything I can do to fix it? Remember to apply textured-materials to faces rather than components/groups. Textures with 'skewed' UV-mapping will no be correct - make these materials unique before you export. I suspect this as the main problem... IF you have faces showing with 'default-material' when they aren't in the SKP then I suspect that you have modeled [or have imported others' objects] with some of the faces 'reversed'. So here is my version of the FixReversedFaceMaterialsDE.lingvo. I hope it will help other German users ("Viel Spass damit!"). Perhaps it's better posted or linked to the FixReversedFaceMaterial topic? Thanks TIG for this plug-in. I am having some trouble getting this plug-in to show up in the file menu. I placed it in the Plugins folder, but it still won’t show up. I'm assuming you get no error messages with it ? I just exporeted something, but how do I access it? Jabberwock xeno wrote: Hey, i'm new here. I just exported something, but how do I access it? Look in the Model's folder. There will be the Model.SKP file [and perhaps Model.SKB backup file]. After running the OBJexporter you should also have a Model.OBJ file and a Model.MTL. 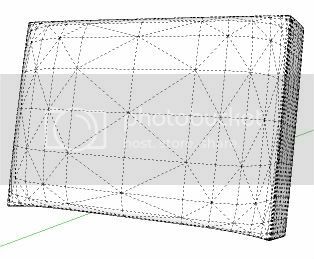 The OBJ file defines the geometry and its matching MTL file defines the materials. If there are 'textures' used by any materials then the required image files are put into a subfolder named 'Model_Textures'. If you now import the OBJ file into an application it will automatically look for the material MTL file in the same folder as the OBJ... and if there are any images needed by the MTL file that looks in the 'Model_Textures' subfolder that is with the two files... So if you move the files you must ensure that they and the subfolder are all kept together in the same relationship - if you are sending them to someone else zip them in the same relationship too. Any insight as to what I may be doing wrong? I does export faces as triangles - irrespective of their original form. The exporter is not re-using vertices, instead creating new entries for each face regardless if they are already in the vertex list. Since the faces aren't welded, they 'break' when editing. Would it be possible to export with welded faces?